I had the honor of visiting Appledore Island off the coast of Maine/New Hampshire last week. The 95 acre island is the largest of a cluster of islands in the Gulf of Maine, referred to as The Isle of Shoals. Trolling into the dock on a zodiac. Photo by Bill Clark. Admittedly, this trip was long overdue. The lure for me is an extensive banding program that uses large, colored, field-readable bands on Herring and Great Black-backed Gulls - a rather unique project that's unmatched in the United States when it comes to gull banding. Dr. Julie Ellis of Tufts University began banding gulls here in 2004 and she's spearheaded the program since. The program is contributing much information on the migratory patterns, survival rates and behaviors of these birds. The island is home to nearly 850 pairs of HERGs and about 500 pairs of GBBGs. Here's a neat video produced by the Cornell Lab of Ornithology showing how these birds carve out and maintain territories on this relatively small spit of land. Adult Lesser Black-backed - Green F05, also known as Pierre. Daytona Beach Shores, FL. January 2015. You'll recall this is the same site where Dr. Ellis and her colleagues found the now infamous male Lesser Black-backed Gull (Green F05) nesting with an adult Herring in 2007 (and then subsequently in 2008 and 2009). 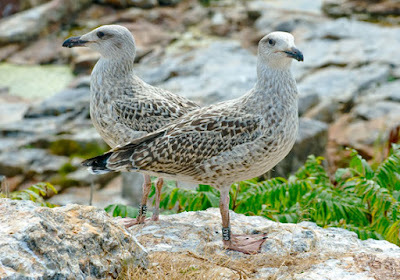 Thereafter, I began referring to the putative hybrids of these two species as "Appledore Gulls". Much remains to be learned about identifying this presumably increasing hybrid in North America. The hybrid chicks - some banded - have been documented with photographs along the Atlantic seaboard, all the way down to Florida and Alabama. As I arrived on the island I was met by gull connoisseur, Bill Clark. Bill has devoted much time and energy with these birds, and he's been instrumental with the program's on-going success. As we began walking away from the dock, I immediately sensed just how comfortable the gulls are here - some apparently having nested and now caring for their young right along the walking paths leading to the lab. Multiple pairs of HERGs & GBBGs sat near the entrance to our dorms. An adult GBBG with its chick allowing us to pass. David Botner and the summer interns. After a short tour and a generous lunch, I was cautioned about the notorious Appledore Clover (poison ivy) and our chick-banding commenced. I was drawn by how fast this team of young students, led by Cornell's Dr. David Bonter, worked. They had already banded some 40+ chicks that morning and were now going for round 2, which resulted in another 32 chicks being banded. Shailee and Dallas double-checking a weight. Much care is taken to ensure the chicks are released back onto their parent's territory. Not doing so can easily result in the chick's demise as other territorial adults quickly move in for the attack. That's simply the nature of these colonial nesters. the hard way in a Ring-billed/Herring Gull colony in East Chicago once. The chicks - almost all still flightless - were captured by hand after usually putting on a short chase through the rocky terrain. Brought back to an informal banding station in a cloth bag, they were fitted with a federal band and a field-readable band on separate legs. Next, a blood sample is taken from the underwing, a preen-gland feather sample is cut, and a wing measurement is noted. Finally, the chick's weight was recorded along with any pertinent notes such as "Chick A, B or C", with any sibling relations noted. GBBG chicks with federal and field-readable bands. Copyright UNH. The parents, although mildly stressed and agitated, seem to anticipate the return of their young. This pair flew in and sat just a few feet beside us, watching as we banded their chicks. Adult GBBGs (presumably the male in front and female behind). Federal bands are coupled with a field-readable band. Boundaries being maintained via long calls. The rocky niche where Green F05 was first discovered nesting. The gulls frequently follow the local fishing boats off the island. Nature governs as it will. A physical altercation that ended with the Herring on the left having the upperhand. Adult GBBG (Black 9Z6) with chick standing in the day's last hour of sunlight. As day 1 came to its end, we gathered outside on the front steps and took in a mesmerizing sunset over the mainland. Some respite time was much deserved as we'd awake the next morning at sunrise and repeat the banding circus all over again - I was stoked! You might remember that last spring I found one of Appledore's young Great Black-backeds some 1,000 miles away in Whiting, Indiana on southern Lake Michigan. Earlier this year, I resighted Green F05 (Pierre) in Daytona Beach Shores, Florida. Exciting stuff! You too can help track these gulls by taking a little time to sort through your local gull flocks! The large field-readable bands have made it easy for anyone to contribute to this project, and it's this message that I hope my reader takes from this post. Color bands are gaining much popularity as more gull banders in North America begin to utilize them. You can read more about the Gulls of Appledore Island and the ongoing research, here. You'll find information on where to report a banded gull should you encounter one. Every resight helps strengthen the vast database of information that's being accumulated. There's much more to be learned about this avian family that's so commonplace on our continent. Thanks to Julie Ellis for extending the invitation and Bill Clark for entertaining all of my questions and hosting me. I'd also like to thank David Bonter for his patience and cordiality, and allowing me to tag along and help band some of this season's chicks. This may be a stupid question, by why does the GBBG with the chick have such a pale back? All of the ones that I've seen have a black back, whereas this one is more of a dark grey. Also, don't they normally have darker eyes? Are you referring to the last photo? No, sorry, the fifth one. Ah. In the summer months even adults seem to fade some, but admittedly the image is overexposed making the bird appear paler. As for eye color on adults, there is a good amount of variation - some dark and some paler. Also, I love your blog, but I wish you would do some posts explaining gull ID, as not all of us are as great as you are.